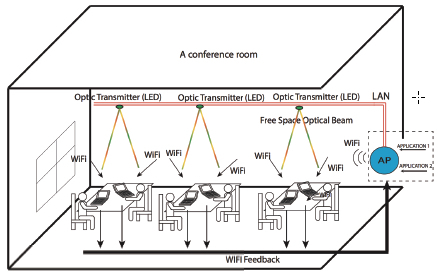 Researchers at Oregon State University have invented a new technology called WiFiFO (WiFi Free space Optic) that can increase the bandwidth of WiFi systems by 10 times, using optical transmission via LED lights. The technology could be integrated with existing WiFi systems to reduce bandwidth problems in crowded locations, such as airport terminals or coffee shops, and in homes where several people have multiple WiFi devices. Experts say that recent advances in LED technology have made it possible to modulate the LED light more rapidly, opening the possibility of using light for wireless transmission in a “free space” optical communication system. “In addition to improving the experience for users, the two big advantages of this system are that it uses inexpensive components, and it integrates with existing WiFi systems,” said Thinh Nguyen, an OSU associate professor of electrical and computer engineering. Nguyen worked with Alan Wang, an assistant professor of electrical and computer engineering, to build the first prototype. “I believe the WiFO system could be easily transformed into a marketable product, and we are currently looking for a company that is interested in further developing and licensing the technology,” Nguyen said. The prototype creates an invisible cone of light about one meter square in which the data can be received. To address the issue of a small area of usability, the hybrid system can switch between either several LED transmitters installed on a ceiling or the existing WiFi system. (credit: Qiwei Wang et al. The system can potentially send data at up to 100 megabits per second. Although some current WiFi systems have similar bandwidth, it has to be divided by the number of devices, so each user might be receiving just 5 to 10 megabits per second, whereas the hybrid system could deliver 50–100 megabits to each user. In a home where telephones, tablets, computers, gaming systems, and televisions may all be connected to the Internet, increased bandwidth would eliminate problems like video streaming that stalls and buffers (think Netflix). The receivers are small photodiodes that cost less than a dollar each and could be connected through a USB port for current systems, or incorporated into the next generation of laptops, tablets, and smartphones. A provisional patent has been secured on the technology, and a paper was published in the 17th ACM International Conference on Modeling, Analysis and Simulation of Wireless and Mobile Systems. The research has been supported by the National Science Foundation. Recent advances in free-space optical technology promise a complementary approach to increasing wireless capacity with minimal changes to the existing wireless technologies. This paper puts forth the hypothesis that it is possible to simultaneously achieve high capacity and high mobility by developing a communication system called WiFiFO (WiFi Free space Optic) that seamlessly integrates the recent free- space optics technologies and the current WiFi technologies. We briefly describe the WiFIFO architecture then discuss the main contribution of this paper that is optimizing the capacity of the proposed WiFiFO system. Specifically, we consider the problem of power allocation for multiple FSO and WiFi transmitters in order to achieve maximum system capacity for given budget power. A mathematical model of the combined capacity of FSO and WiFi channel is derived. We show that the power allocation problem for WiFiFO can be approximated well as a convex optimization problem. To that end, an algorithm based on gradient decent method is developed. Simulation results indicate that the proposed algorithm, together with system architecture can provide an order-of-magnitude increase in capacity over the existing WiFi systems.